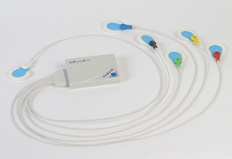 Enduro™ is a portable, battery powered, noninvasive cardiac output device that was designed primarily to be used while a subject or patient is exercising. Enduro™ is unique in that it is the only device that can reliably and repeatedly provide cardiac output during exercise. A fundamental characteristic of patients with chronic heart failure is an impaired ability to increase cardiac output appropriately with exercise. Many patients are able to improve cardiac output after interventions; cardiac resynchronization therapy and exercise training are directly correlated with this. Quantifying cardiac output can therefore provide important information about these and other interventions. Recent studies have also demonstrated that this information is valuable in predicting outcomes in patients with cardiovascular disease. Based on the advanced PhysioFlow® Enduro™ technology, PhysioFlow® has been further developed to reduce costs and enhance user friendliness. 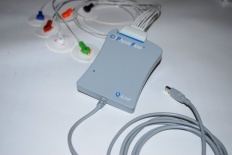 The result is PhysioFlow® PF07 Q-Link™, all the performance of Enduro™ without the batteries and with a simple USB connection to the computer. The HD-Z™ filter for high performance noise cancellation is embedded as well, enabling measurements even during high intensity exercise. The combination between advanced hardware, low cost of use, and powerful yet user friendly software enables more routine uses in the clinical area. They range from heart failure to severe hypertension, and of course all critical care applications.